The kids' meal or children's meal is a fast food combination meal tailored to and marketed to children. Most kids' meals come in colourful bags or cardboard boxes with depictions of activities on the bag or box and a plastic toy inside. The standard kids' meal comprises a burger or chicken nuggets, a side item, and a soft drink. The Happy Meal contains a main item (typically a hamburger, cheeseburger, or small serving of Chicken McNuggets), a side item (french fries, apple slices, a Go-Gurt tube, or a salad in some areas), and a drink (milk, juice, or a soft drink). The choice of items changes from country to country, and may depend on the size of the restaurant. A cheese sandwich is a basic sandwich generally made with one or more varieties of cheese on any sort of bread, such as flat bread or wheat bread, that may include spreads such as butter or mayonnaise. A typical grilled cheese sandwich is made by grilling the sandwich with butter or margarine and toasting it. 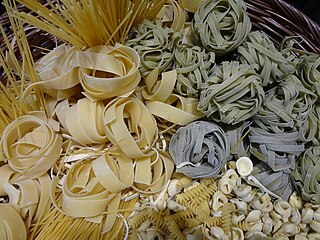 Pasta is a staple food of Italian cuisine. Pasta is typically made from an unleavened dough of durum wheat flour mixed with water or eggs, and formed into sheets or various shapes, then cooked by boiling or baking. Rice flour, or legumes, such as beans or lentils are sometimes used in place of wheat flour to yield a different taste and texture, or as a gluten-free alternative. In 1977, the McDonald's restaurant owner clients who regularly met with Bernstein were looking for ways to create a better experience for families with kids. Bernstein reasoned that if kids could get a packaged meal all their own instead of just picking at their parent's food, everybody would be happier. He had often noticed his young son at the breakfast table poring over the various items on cereal boxes and thought, "Why not do that for McDonald's? The package is the key!" He then called in his creative team and had them mock up some paperboard boxes fashioned to resemble lunch pails with the McDonald's Golden Arches for handles. They called in nationally known children's illustrators and offered them the blank slate of filling the box's sides and tops with their own colorful ideas from art to jokes to games to comic strips to stories to fantasy: whatever they thought might appeal to kids, at least 8 items per box. Inside the box would be a burger, small fries, packet of cookies and a surprise gift. A small drink would accompany these items. Bernstein named it The Happy Meal and it was successfully introduced with television and radio spots and in-store posters in the Kansas City market in October 1977. Other markets followed and the national roll-out happened in 1979. Thank you for bringing the Happy Meal, a bold idea, to the McDonald's System. Your insight and conviction truly has made McDonald's a fun place for children for the past 10 years! 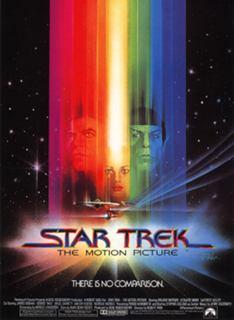 Star Trek: The Motion Picture is a 1979 American science fiction film directed by Robert Wise and based on the television series of the same name created by Gene Roddenberry, who also served as its producer. It is the first installment in the Star Trek film series, and stars the cast of the original television series. The film is set in the year 2271, when a mysterious and immensely powerful alien cloud known as V'Ger approaches Earth, destroying everything in its path. Admiral James T. Kirk assumes command of the recently refitted Starship USS Enterprise, to lead it on a mission to save the planet and determine V'Ger's origins. The Happy Meal did not introduce the practice of providing small toys to children. When the Happy Meal started in 1979, the toys back then were a McDoodle stencil, a McWrist wallet, an ID bracelet, a puzzle lock, a spinning top, or a McDonaldland character-shaped eraser. In Canada, the promotion prior to the Happy Meal was called the "Treat of the Week", where a different toy was available free on request each week. This promotion continued after the Happy Meal was introduced in 1979. Happy Meal toys have become increasingly elaborate in recent years. While initially they were little more than a cheap plastic trinket such as a Frisbee or ball, they have gradually been replaced with increasingly sophisticated toys, many of which are a tie-in to an existing TV show, film, or toy line. Burger Chef was an American fast-food restaurant chain. It began operating in 1954 in Indianapolis, Indiana, expanded throughout the United States, and at its peak in 1973 had 1,050 locations, including some in Canada. The chain featured several signature items, such as the Big Shef and Super Shef hamburgers. A value menu is a group of menu items at a fast food restaurant that are designed to be the least expensive items available. In the US, the items are usually priced between $0.99 and $1.49. The portion size, and number of items included with the food, are typically related to the price. Fast food advertising promotes fast food products and utilizes numerous aspects to reach out to the public. Changeables, also known as McRobots, was a toy series produced by the McDonald's corp. and given away with fast-food meals at their restaurants. The series used the then-popular "Transforming Robots" toy concept in conjunction with their own products. The robots could transform into items from the company. There were three series of McRobots. A&W Food Services of Canada, Inc. is a Canadian fast food restaurant chain. The chain was originally part of the U.S.-based A&W Restaurants chain, but was sold to Unilever in 1972, and then bought by its management in 1995. It no longer has any corporate connection to A&W operations outside of Canada. BK Chicken Fries are a fried chicken product sold by the international fast-food restaurant chain Burger King. At the time of their introduction in 2005, the company had intended Chicken Fries to be one of their larger, adult oriented products made with higher quality ingredients than their standard menu items. Additionally, the product further targeted the snacking and convenience food markets with a specific packaging design that was intended to be easier to handle and fit into automotive cup holders. The product was part of a series of product introductions designed to expand Burger King's menu with both more sophisticated fare and present a larger, meatier product that appealed to 24- to 36-year-old males. Along with this series of larger, more complex group of menu products, the company intended to attract a larger, more affluent adult audience who would be willing to spend more on the better quality products. They were discontinued in the United States in 2012, but continued to be sold in some markets, such as Italy. In August 2014, they were reintroduced for a limited time offering (LTO) in North America, leading to their permanent re-addition to the menu in March 2015 in over 30 countries globally. BK Chicken Nuggets are a type of chicken product sold by the international fast food restaurant chain Burger King. It is one of their snack oriented products designed for convenience of consumption. When the predecessor of international fast food restaurant chain Burger King (BK) first opened in 1953, its menu predominantly consisted of hamburgers, French fries, soft drinks, milkshakes, and desserts. After being acquired by its Miami, Florida franchisees and renamed in 1954, BK began expanding its menu by adding the Whopper sandwich in 1957, and has since added non-beef items such as chicken, fish, and vegetarian offerings, including salads and meatless sandwiches. Other additions include a breakfast menu and beverages such as Icees, juices, and bottled waters. As the company expanded both inside and outside the United States, it introduced localized versions of its products that conform to regional tastes and cultural or religious beliefs. To generate additional sales, BK occasionally introduces limited-time offers of special versions of its products, or brings out completely new products intended for either long- or short-term sales. Not all of these products and services have been successful; in 1992, Burger King introduced limited table service featuring special dinner platters, but this concept failed to generate interest and was discontinued. 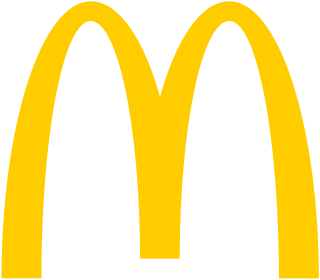 McDonald's Corporation is the world's largest chain of fast food restaurants, serving around 68 million customers daily in 119 countries. McDonald's traces its origins to a 1940 restaurant in San Bernardino, California. After expanding within the United States, McDonald's became an international corporation in 1967, when it opened a location in Richmond, British Columbia, Canada. By the end of the 1970s, McDonald's restaurants existed in five of the Earth's seven continents; an African location came in 1992 in Cape Town, South Africa. Burger King Dinner Baskets were a series of products introduced in 1993 by the international fast-food restaurant chain Burger King. The products were designed to add appeal to families and customers looking for a "higher class" meal found in family style restaurants. Al Bernardin was an American restaurateur and businessman who invented the McDonald's Quarter Pounder in 1971 as a franchise owner in Fremont, California. The creation of the Quarter Pounder earned him the nickname "Fremont's hamburger king." ↑ "Sliced apples sold to McDonald's, Burger King and grocery chains recalled for Listeria". CBS News. August 13, 2012. ↑ "La señora del Mac menú". El Periodico. 1 August 2006. Archived from the original on 3 February 2014. ↑ Pellicer, Lilliana. 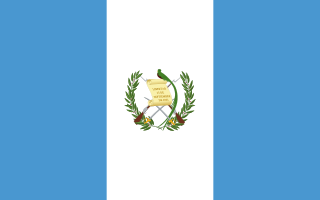 "Señora Presidenta". Prensa Libre. Archived from the original on 19 March 2012. Retrieved 27 July 2011. ↑ "Creator of the Happy Meal Says KC Makes Him Happy". NBC Action News. Retrieved 18 August 2011. ↑ Applegate, Jane W. (October 23, 1988). "Food for Tots". Los Angeles Times. p. 1. ↑ "Prizes Recalled By McDonald's". The Washington Post. November 3, 1982. p. A1, B1. ↑ Olly Richards (September 1992). "Trouble in Gotham", Empire , pp. 21—23. Retrieved on 2008-08-14. ↑ Choi, Candice (2013-02-04). "McDonald's to put 'Fish McBites' in Happy Meals". Yahoo! News . Retrieved 2013-02-04. ↑ Tuttle, Brad (23 May 2014). "Why McDonald's Is Loving the Creepy New Mascot Everybody's Bashing". time.com. Retrieved 28 July 2017. ↑ Staff. "25 of the Coolest McDonalds Happy Meal Toys from the 1980s - TechEBlog" . Retrieved December 10, 2016. ↑ "San Francisco Overrides Mayoral Veto, Bans Happy Meals with Toys". CNN. November 23, 2010. Retrieved December 15, 2010. ↑ "San Francisco's Happy Meal Ban". The Daily Show with Jon Stewart. January 3, 2011. ↑ "McDonald's finds a way around San Francisco's 'Happy Meal ban'". NBC News. November 30, 2011. ↑ "McDonald's Can Keep Happy Meal Toys, Court Rules". ABC News. 2012-04-06. Retrieved 2012-06-12. ↑ Cuen, David (4 August 2012). "Chile bans toys in children's meals to try to fight obesity". BBC. Retrieved 28 August 2017.